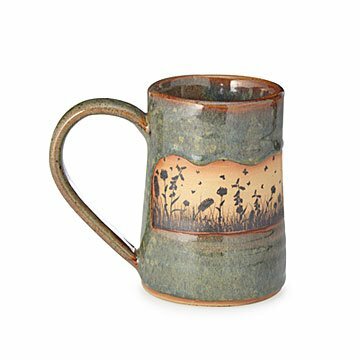 Alan Yarmark fills the band of his rustic mug with a spectacular, original illustration. It may look like just a beautiful rendering, but the woodland scene on this mug is actually a portal to an enchanted world. Will you jump in with us? Alan Yarmark creates the unique design from stoneware, dipping the top and bottom in layers of vibrant green and burgundy glazes. He leaves the center band raw, filling it with a spectacular illustration. The result is this rustic, eye-catching design that makes a memorable housewarming or birthday gift for nature lovers. Handmade in Villa Grove, Colorado. I love good quality and beautifully made pottery. This mug fits that description. It is prettier in person. The background looks like a muted field of flowers. Purchased as gifts for my office mates. Beautiful and good size for coffee or tea. Dishwasher safe is always a plus. I just love this mug! The craftsmanship is superb!